"A convenient application that allows different Windows users to use different resolutions without manually having to change it." There are a lot of times when a computer is used as a family computers. 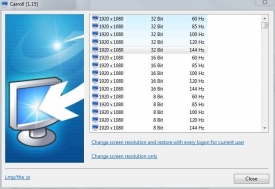 Other users of the computer have particular settings they prefer for when they use the computer, and Windows covers a lot of these settings that are specific for each user account on Windows. However, there is one thing user accounts can't do that can be pretty troubling for some users - you can't set a specific resolution for your user account. For example, you share a personal computer with someone that uses a lower resolution since they have poor vision and like having things at a larger size on their monitor, specific text. They can use this application to make it so when they log on to Windows, the system will automatically set the resolution to their preferred settings. This will also make it so when other users use the computer, they will not have to set the resolution back to the native every time they use it - it will automatically be set for them. This can be very useful for families that prefer to use different resolution settings for their user accounts. This is a feature that Windows does not have natively, so adding this very convenient application to do the job for you saves you from having to do it yourself every time you log onto Windows. Save yourself a few extra sets and use Carroll to set your preferred resolution on Windows automatically each and every time you log into Windows on your family used personal computer.